Call today to get it cheaper to your door then on Amazon! These tough, durable plastic cones are perfect for speed, quickness, jumping and agility drills. These are the kettlebells you want! All cast iron, no cheap handles, no warped or plastic bottom, no thin grip! Create just the right amount of resistance with the ideal workout tool that you can use anywhere, anytime, in just minutes a day! The random bounces of the reaction ball improve overall coordination, reaction time and depth perception. This ball can be bounced off of any hard surface. This 9 foot weighted rope features cushioned, non-slip handles with removable weights and an easy swivel design for unrestricted rope movement. 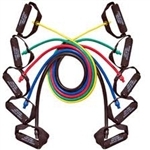 The ball bearing action and contoured plastic handles make this the smoothest, quickest and most comfortable jump rope. These medicine balls add a textured grip and adjustable air pressure to bring modern functionality and flexibility to time-tested medicine ball exercises. You don't need a gym to get a full body workout. Just a door, the TRX Suspension Trainer and this simple, yet handy Door Anchor. Simple yet unique core trainer offers low-back comfort and support during ab exercises. The top end of the mat is smooth for maximum user comfort and stability while the bottom side features contours to minimize the potential for slippage or movement. Great for performing lower and upper body slide board style exercises. Our latex free Foam Rollers are perfect for balance exercises, stability exercises, strength training, home exercise, home physical therapy, as well as use in a clinical setting. 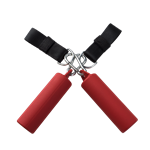 Durable rubber construction is easy to grip and easy to clean. Rubber end caps are color-coded by weight, so you can grab just the right weight for your chosen workout. 8" Long Standard loading pin, Solid steel plate base, Self- standing, Great for hand exercises and dip belt squats. Grip strength is often overlooked in strength training, but it is a critical aspect to increase performance of athletes and fitness enthusiast. Body-Solid's new BSTCB Cannonball Chin-Up Grips provide several ways to increase grip strength. Slam away with these durable Slam Balls!